Hey, New Yorkers! Don’t forget that my pop-up shop will be open from 12 – 8 PM, today (Friday) and Saturday. Come visit me at 48 Greenwich Avenue, near Perry Street. The location is conveniently close to the Union Square subway station. Hey, everyone! 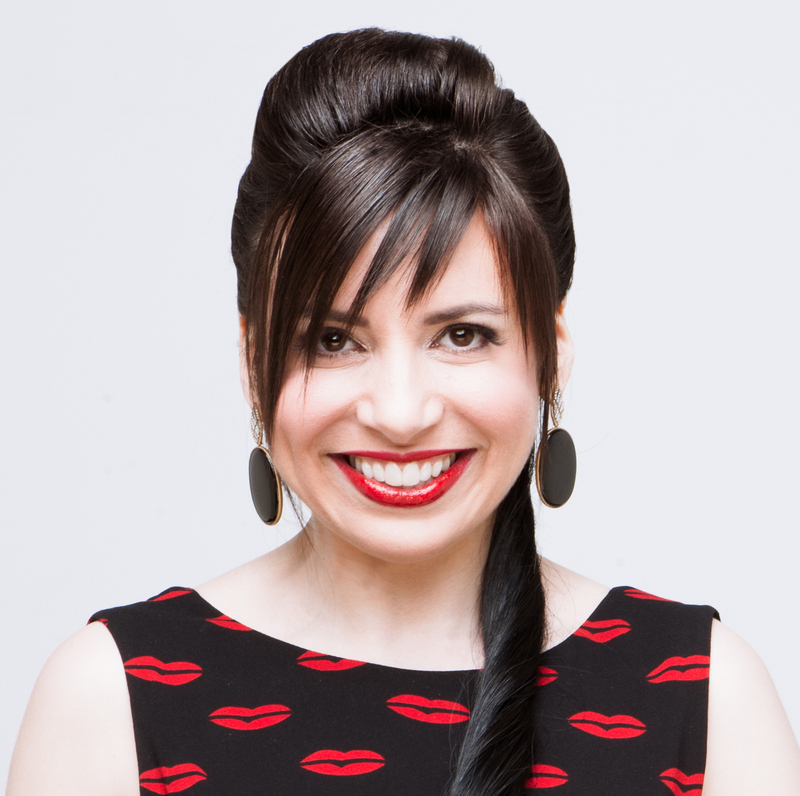 I recently gave gorgeous blogger Susanna a little inside information, but now I’m ready to share it with y’all. I’m discontinuing a number of styles, including all of the fruit necklaces. Also saying buh-bye are the diamond-topped Mignonette earrings. I have them in blue topaz, lemon citrine, garnet, smoky topaz, rhodochrosite and a beautiful transparent quartz flecked with red (the red is from iron). Finally, this is the last of the rock crystal and diamond chrysanthemums. 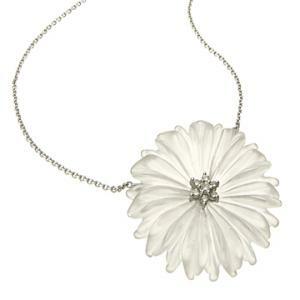 The Chrysanthemum was a symbol of good cheer in Victorian times. I still love these pieces, but I need to focus on important new designs I’ve got coming. Actually, the ones I am discontinuing would be perfect for that big deal I’m going to do with H&M any day now (H&M, please call me!). But H&M isn’t going to have them in 14K or 18K gold, so if you love fine jewelry, holla at me at wbjewelry at hotmail dot com. The holidays are coming! Buy yourself or someone you love a gift. Hell, you can even buy someone you hate a gift. Is your bete noire allergic to strawberries? My strawberry necklace will send a very special message indeed. I will give you the incredible sample sale price as long as supplies last (but you gotta ask for it). 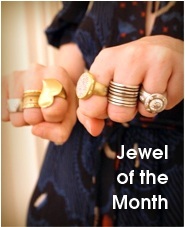 You might luck out and get a one-of-a-kind piece like Susanna did. Susanna has the only mushroom necklace I ever made. Up close and personal with Susanna's 'shroom. Feel free to ask for measurements. 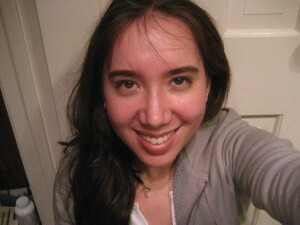 Most of my jewelry is much bigger than it appears in photographs, but the Mignonette earrings are the opposite. They’re quite petite. Photographing jewelry without a live model or a prop to indicate size is always tricky. Why don’t I use models and props, you ask? I need photographs with a plain white or neutral background for press and stores. I’d rather spend money on new designs than on two separate shoots. This is an issue for everyone. Even I occasionally see ads from the major jewelers, look at the price and think, “Oh my God, how are they selling that ginormous necklace for so little? What am I doing wrong?” Then I go see the piece and it’s TINY. The only time I’ve used props was for the Wendy Brandes for Francis SmacEnroe tennis necklace. That piece is so big that I absolutely had to put it next to tennis balls to show the size. No, you can’t play tennis with the necklace, but the tennis balls were scared when they saw it. Hope to see you townies at the shop and hear from you out-of-townies via email. You can also DM me on Twitter or message me on Facebook. I’m not fussy. Here’s the shop info one last time. Wait. What? Have I not looked in a while? Those fruit necklaces are so fabulous! Bet you guys are having a blast right now! Wishing you much success over the next 2 days, I’m sure it will be such a fabulous event!! Good luck with the pop-up shop! The pomegranate one has always been my favourite. 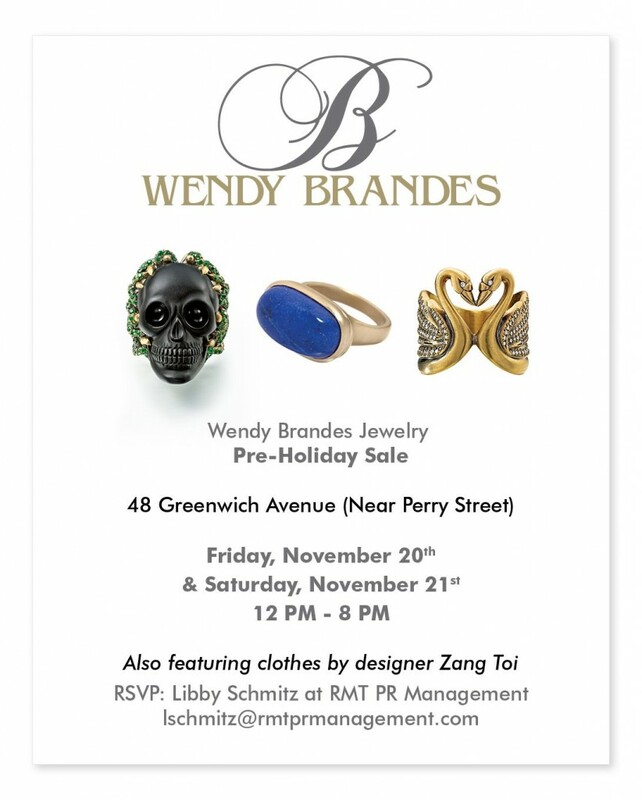 I can’t imagine giving Wendy jewels to a frenemy. Couldn’t do it! Although others aren’t as principled as me. i don’t think i’ve ever seen the fruit necklaces! fruit is good for you. 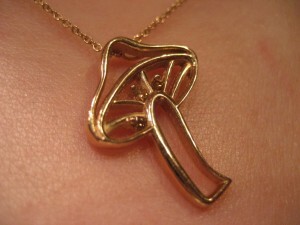 Love this mushroom pendant. Sooo cute! “To be or not be, that is the question.” Miss J had to quote Shakespeare since her anti-spam word is Hamlet. 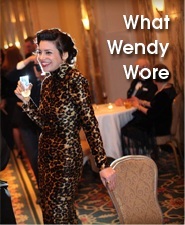 Sadly, Miss J will NOT BE at Miss Wendy’s fabulous sale, but she wishes Miss Wendy a lot of fun & success. Noooo! 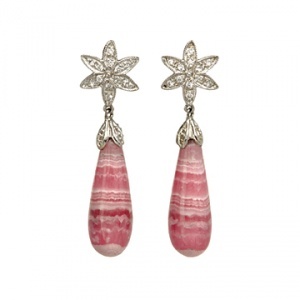 I’m so sad you’re discontinuing the mignonette earrings. They’re out of my budget now or I would get the blue topaz. Maybe someday when I’m rich (and hopefully not famous) I can order them as a special order. the fruit necklaces are too adorable! i love them. I am hoping its going amazingly at the pop up shop!wishing you lots of business for today and tomorrow. brb adding huge selection of WendyB jewels to my holiday wish list. Wishing you the best for this weekend! Good luck and have fun tonight! Best of luck with the sale. I wish I could be there! The fruit necklaces are BEAUTIES! If I ever “come into some money” I’m gonna buy something and it will be the only piece of real jewelry I own. I know I’m late (I just saw this) but can I get a sample sale price on one of the Eden necklaces (if they’re still available) online? ah, i always loved the fruits!